If you’re searching for a new home, give Mapumental Property a try. lt narrows property results down, only showing you houses that fall within a decent commute time from the places you visit regularly – like work, school, or the shops. Here, have a go – it’s fun. Several years ago, some of our colleagues were looking for a house to rent. They weren’t set on a particular town. There were two important factors: that it was within a reasonable commute from central London, where they frequently attended meetings; and that the rent was affordable. Faced with these requirements, most of us would sift through property sites and cross-reference the listings manually with public transport information. It’s rather time-consuming, and slightly irritating, but hey-ho, it has to be done. But mySociety is in the business of building useful web tools, so when something irritates us like this, we look to see if we can solve the problem through the magic of code. In a stroke of good timing, it was at just around this time that the Department for Transport approached us to ask us to work with their public transport data – and Mapumental was conceived. The key was to combine Ordnance Survey postcodes with the DfT’s data about journey times, NPTDR (National Public Transport Data Repository). This data set takes a ‘snapshot’ of every public transport journey in Great Britain for a selected week in October each year. Sounds simple? The process was not without its challenges. Prime among them was the problem of displaying map tiles, plus the vast quantities of transport data, within a reasonable amount of time, no matter which postcode or zoom level the user chose. As we know, a ‘reasonable amount of time’ for a page to load is a metric which is forever shrinking. By 2006, we had created Mapumental’s first iteration. Users could input a postcode and see all areas of the country that could be reached by public transport, divided into coloured travel-time bands. In 2009, Francis Irving, the mySociety coder behind Mapumental’s early endeavours, explained the technology he’d used. It was Flash-dependent, and a few years later, developer Duncan wrote about some of the technical hurdles he overcame replacing the Flash elements, in view of the rise of the iPhone, which famously doesn’t ‘do’ Flash. Hoorah! Now our colleagues could type in a central London postcode and see everywhere that fell within a 40-minute journey from there. It wasn’t long before we added median house price data, too. We even added a ‘scenicness’ rating: if the beauty of your surroundings was important to you, you could rule out anywhere below a certain level of attractiveness. How did we assess how scenic every area in the UK is? 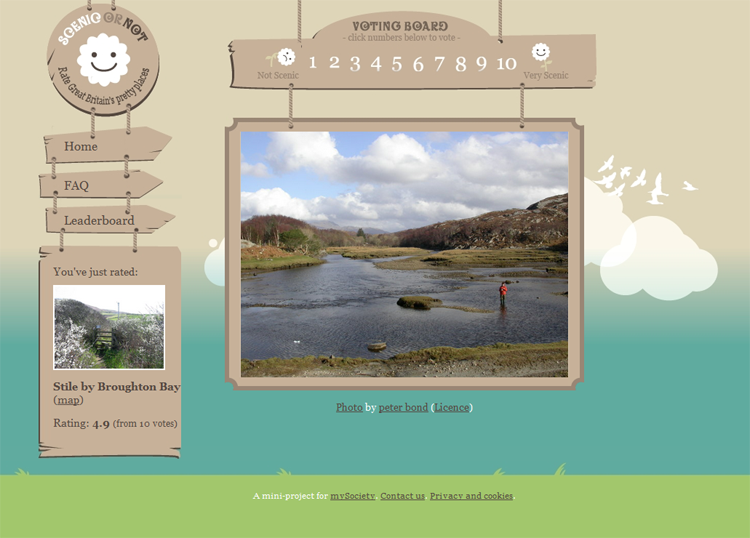 By crowdsourcing the information – our ScenicOrNot website displays a random photograph from every square mile of the British isles, inviting people to rate them. It is surprisingly compulsive. Mapumental may have been born from our own needs, but we knew from the beginning that it would have wider applications. It has always been the sort of project that got people excited, once they saw it in action. 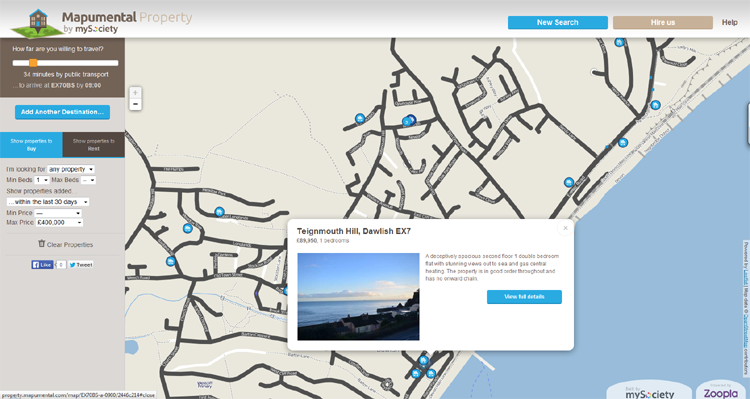 We wanted to show how elegantly Mapumental can handle all kinds of data, starting with houses for sale and rent – so we developed Mapumental Property. It’s not intended as a serious competitor to the giant property websites out there. Rather, it’s an all-singing, all-dancing demonstration of Mapumental’s strengths. In this case, the data is from the property website Zoopla, and you can narrow it down to show rental or sales property within your chosen price bands and commute distances. You can even add multiple destination points, so that households of two or more people can find their optimum location. But Mapumental is not just about property: swap out that Zoopla layer, and you could put in anything else you can imagine – hospital locations, supermarkets, schools, job vacancies… you name it. The beauty of Mapumental is that now we’ve done the really hard part, incorporating new data layers is relatively simple. Recent work for the Fire Protection Association and the Welsh Government, among others, has shown its versatility. We believe that Mapumental’s possibilities are pretty much endless. Have you got an unloved, difficult-to-navigate dataset that Mapumental could breathe new life into? Or would your stakeholders benefit from being able to see your data displayed on a map? Let us know.